Birth City: Santo Domingo, D. R.
April 5, 2019: Ramón drew attention with his bat, going 4-for-4 while driving in both A’s runs in a 3-2 loss to the Astros. He had 3 singles, a double, and 2 RBI. Laureano was born in the Dominican Republic. But he moved to the United States to attend Northeast Oklahoma A&M College. Laureano dominated the junior college level his sophomore season hitting .429 with 13 HR, 69 RBI and more walks than strikeouts. This production was enough for the Astros to take Laureano in the 16th round of the draft. Ramon has a really good work ethic. And he has a sharp baseball intellect and a desire to learn and improve. In 2017, the Baseball America Prospect Handbook rated Laureano as the 13th-best prospect in the Astros' organization. But in 2018, he fell to #29. 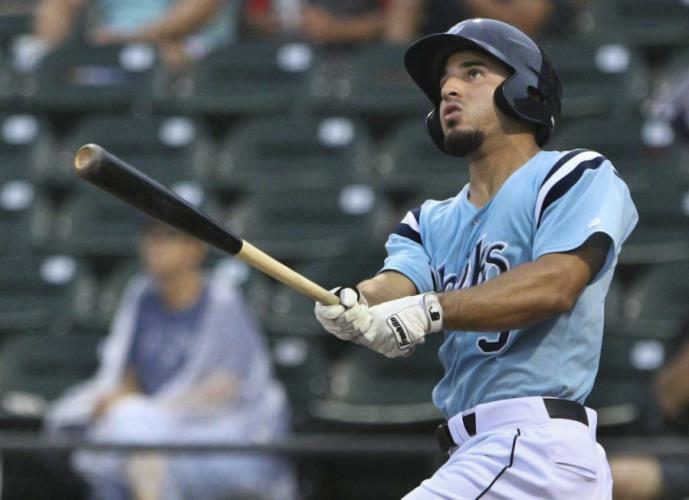 June 2014: The Astros chose Ramon in the 16th round, out of Northeastern Oklahoma A&M Junior College. He signed with the Astros via scout Jim Stevenson. Nov. 20, 2017: The Astros traded OF Ramon Laureano to Oakland in return for RHP Brandon Bailey. Laureano has a shot at becoming a five-tool player. Ramon is very quick to the ball, with excellent bat speed and a compact righthanded stroke. He improved his pitch selection in 2016. Laureano has a quiet setup at bat and a simple righthanded line-drive swing. In 2018, Laureano was named MLB Pipeline Hitting Prospect of the Year for the A's. Laureano is a scrappy player who gets involved in everything in the field. He specializes in highlight video catches. Ramon plays all outfield positions and earns plus grades for his defense, speed and arm. He has shown great accuracy with his throws and excellent instincts. He also showed leadership during his time in the minors. In 2018, Laureano batted a nifty .288/.358/.474 for the A's, but it was his defense that raised eyebrows the most. In only 48 games, he was worth plus-4 Defensive Runs Saved and, according to Statcast, plus-3 Outs Above Average. A couple of plays in particular stood out. April 1, 2019: Laureano showed off his magnificent arm again in the A’s 7-0 win over the Red Sox in Oakland. With the game still scoreless in the top of the second inning, Mitch Moreland stroked a one-out single to center with Xander Bogaerts on second base. Bogaerts is pretty fast, and all but the slowest runners in the league would expect to score from second on a single to the outfield. Ramon has 60 speed. He is an aggressive runner, too. So he hinders the opposition when he beats out an infield hit and then steals second base. July 25-September 23, 2014: Laureano was on the DL. with a finger injury. March-May 21, 2018: Ramon was on the Nashville Sounds DL with a broken finger.